Our enterprise is run by a team of highly qualified personnel, who helps us to manufacture and export an exclusive range of Brass Nut And Nozzle Double Groove. These grooves are used to connect rubber hose with the cylinder or valve nozzles. For manufacturing the groove, we use best quality brass, sourced from the most reliable vendors. 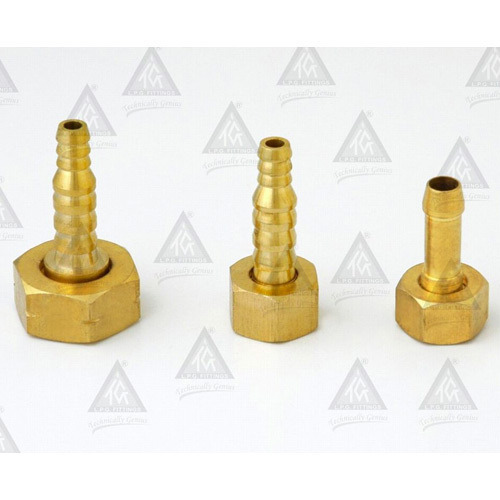 The clients can obtain our Brass Nut And Nozzle Double Groove in different sizes from us. Use : Nut & Nozzle are used for Rubber Hose Connection. Annual Turnover2014-15 Rs. 50 Lakh - 1 Crore Approx. 2013-14 Upto Rs. 50 Lakh. 2012-13 Rs. 50 Lakh - 1 Crore Approx. We take pride in introducing ourselves among the top notch organizations engrossed in manufacturing, supplying and exporting a pristine line of Brass Fittings. Some of the products offered under our label are Brass LPG fittings, Brass Plumbing Fittings, Brass Cable Glands, Brass Terminal Block, Brass High Pressure Connectors And High Pressure Brass Regulator, Brass Stove and Petromax Parts, Brass Precision Components. In addition, we also offer, Brass Heavy Hex Nuts, Brass Nut and Nozzle, Brass Lock Nuts, to name a few. These products are manufactured using premium grade raw material and spare parts sourced from the reliable vendors. Owing to their remarkable features such as longer functional life, sturdy construction, optimum durability, easy operations and excellent corrosion resistance, these are highly demanded in market. We have a state-of-the-art infrastructure, sprawls over wide area. Managed by a team of qualified professionals, the unit is outfitted with all the requisite machines and tools that significantly reduce the production time. We export our range of products to Australia/NZ, Indian Subcontinent, East/Middle Africa, North Africa and others. Apart from this, we accept payment via various modes such as cash, cheque or online to simplify the complex process of monetary transactions. Our products are delivered to our customers with the help of our different modes of shipment.